The claim that we are living in ‘unprecedented times’ is itself becoming disconcertingly ‘precedented.’ This is perhaps to be expected when we live in a world where Britain’s Foreign Secretary hosted Have I Got News for You and the White House is occupied by the presenter of the American Apprentice. In 2010, a coalition government seemed unprecedented. So too did the gradual corrosion of health-care services, the dismantling of the arts and culture sectors, the commercialisation of higher education, the rise of food-banks and record levels of homelessness. Then there’s the close result of the Scottish Referendum, the heady triumph of Jeremy Corbyn, the widely-reported implosion of the Labour party and, of course, the vote for Britain to leave the European Union. Unprecedented is the new precedent. And now, three years ahead of schedule, there will be a General Election. It will be held just six weeks after it was announced. Not only will this be a challenge for the politicians involved, faced with the unprecedented challenge of condensing three years’ worth of planning into less than the amount of time it takes to broadcast a season of Broadchurch, but this also presents an unprecedented challenge for voters. The actual cover of the Daily Mail, 19 April 2017. Since we all seem to be living in a particularly demented episode of Black Mirror it might be easy to feel like there’s nothing to be done. You may feel like you never get what you vote for. You may feel frustrated and disillusioned. You may feel like it isn’t worth voting because there’s no point. If you feel this, ignore that feeling. You should feel frustrated and you should feel disillusioned, but the only way to assert your will upon government is to vote. But why keep voting, and who should we vote for anyway? These are good questions, and (as ever) the eighteenth century has the answers. Eighteenth-Century Guidance on How to be a Good Citizen. All my research is on the relationship between citizens and the state, and on how that relationship is articulated (and effected) by literature. I work on the long eighteenth century and as part of my PhD I spent a lot of time working on a periodical called The Freeholder, written by a man named Joseph Addison. Addison too lived in ‘unprecedented times.’ The execution of Charles I by parliament, the Glorious Revolution and the Hanoverian Succession all remained in living memory and each raised serious structural, institution and existential questions. The emergence of cheap print meant that there was plenty of advice out there on how to vote, and The Freeholder offered just such advice. Published twice a week across 1715-16, Addison’s paper sought to tell property-owning gentleman (the only demographic allowed to vote at the time) what to think about when completing their ballot. Much of this advice remains extremely pertinent today, so here are three things to bear in mind as you march down to your local memorial hall on polling day. It isn’t about ‘winning’, it is about representation. Addison’s MP represents him. He needs to choose an MP whose interests and agendas closely match his own so that he can then trust that MP to vote and behave in parliament as he would himself. That MP is his ‘remote voice’, making a case in Westminster on Addison’s behalf whilst Addison is at home writing his periodicals. If you vote for a party that doesn’t win, that party doesn’t just disappear. If enough people vote for them they will be represented in the House, which means that they form part of the opposition. They offer an alternative opinion to the party in power and they’ll have to vote, on your behalf, on all these big decisions. Vote for who best represents you so that those views can be aired in parliament. You’re choosing your own ‘voice’, so choose carefully. You’re voting for a party, not a prime-minister. In Addison’s Freeholder, the ‘happy tribe of men’ who make up a political party (a slightly loser affiliation that we know today… for now at least) are more important than the person leading them at the time. The principles of the ‘party’ will persist far longer than the individuals representing them at any given time, and this is perhaps useful to bear in mind today, given that neither Labour nor the Conservative currently have the same leader that they had going into the last general election in 2015. As Addison says in The Freeholder, all politicians are but ‘blossoms in the wind’ whilst government itself is an oak, rooted in the earth. When a man thinks a party engaged in such measures as tend to the ruin of his country, it is certainly very laudable and virtuous action in him to make war after this manner upon the whole body. But as several casuists are of opinion, that in a battle you should discharge upon the gross of the enemy, without levelling your piece at any particular person so in his kind of combat also, I cannot think it fair to aim at any one man, and make his character the mark of your hostilities. Omission is a greater crime than commission. A freeholder is one remove from legislator, and for that reason ought to stand up in the Defence of those Laws which are in some degree his own making. It is stated throughout the Freeholder that it is this connection between citizen and state that constitutes the greatest ‘privilege’ of living in a democratic society. It is, for Addison, what gives the governed power over those who govern and, as we all know, with great power comes great responsibility. If a citizen chooses not to be involved in the process and turns away from the business of politics then they no longer have any stake in who represents them in government. Their views, thoughts, attitudes and opinions are lost. As Addison highlights, this is not only their loss, but the loss of anyone else who shares their outlook and would also have benefited from their vote. What about this snap election? Quoting Addison is all very well and good but he died in 1719, so what good does it do to read his work now? Well, you need only look at the Gothic buildings that house our parliament to see that the one thing we can count on to remain unchanged, even in unprecedented times, is the mechanics of government. Addison’s advice to voters, then, remains relevant. What would Addison want us to remember? Be engaged. Think about who best represents your thoughts, opinions, attitudes and interests and vote for them. Think more about who you want to represent you in parliament than who you foresee as the party in power. Look at the party more closely than you look at the people inside the party and remember, your vote is your voice. If you choose not to vote you have no voice, but if you vote wisely, your voice will be heard in the heart of government. 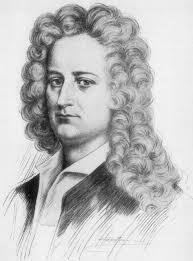 Disclosure notice: Joseph Addison was affiliated with the Whig ministry, a party opposed to the Tories. These are the words of the Aidan Turner’s Ross Poldark, the titular hero of BBC One’s flagship Sunday night drama. I make no secret of my unabashed affection for this show, I think it is terrific and I felt every moment of the dreadful 18 months that it was off the air. That said, when I heard this bracing micro-monologue on the teaser for the new series it wasn’t Poldark that sprung to my mind, it was the other eighteenth-century man in my life: Sheffield’s very own James Montgomery. Memorialised by a life-size statue and the theatre of which he is name-sake, Montgomery is a figure remembered by many in the city. His legacy is as a man who valiantly stood up for the people of Sheffield time and again, petitioned for worker’s rights, religious and racial tolerance, universal access to education and absolute parity in political representation. He was also a vocal advocate for the abolition of slavery. Like Winston Graham’s fictional Poldark, Montgomery was a man who was able to use his relatively privileged position in society to combat the social injustices he saw all around him, and like Poldark, he was often branded a revolutionary and a radical. For the past few months I have been working on a live event based on the extraordinary life of James Montgomery, due to finally be unveiled to audiences next Sunday (25 Sept) on the final day of the University of Sheffield’s Festival of the Mind. I’ve been researching Montgomery’s life and works for the past two years but it wasn’t until preparing for this event that I really began to think of him as a living breathing human being. The performance has been developed in close collaboration with Eclipse Theatre Company, who provided both a director and an actor to help me bring this story to life. On the day Montgomery’s poems, letters, essays and editorials will be performed by actor David Judge. Over the past few months the script that I originally wrote has been work-shopped and revised in close consultation with Artistic Director Javaad Alipoor, who has constantly pushed me to empathise with Montgomery in ways I wouldn’t usually in my academic writing and research. Together we have developed something very different to anything I’ve ever done before. During the show we will juxtapose the mighty posthumous reputation of the older Montgomery with the trials (both figurative and literal) and tribulations of his youth. Prepare to meet the distracted boy who drove his teachers to despair and the teenage run-away who shunned his parent’s religious life to follow in the footsteps of his childhood hero, the poet and libertine Robbie Burns. This will be the story of the young man who aimed for London and landed in the political whirlpool of revolutionary Sheffield, only to throw himself so heartily into conflict with local and national government that he found himself fixed up and thrown in jail, twice. This is the story of the James Montgomery, who, at an extraordinarily precarious point in his life and career, put everything on the line to hold his government to account. Come and meet James Montgomery: the aspiring poet, the sweary punk-rocker, the rebel teenager, the enemy of the state, the great champion of causes and life-long abolitionist memorialised outside Sheffield Cathedral to this day. The real life Poldark of eighteenth-century Sheffield. The show will be on at 12pm and 3pm on Sunday 25 September and it is free to attend. It is not a ticketed event but seating is limited, so be sure to arrive early to avoid disappointment. Read more about the poetry of James Montgomery. Order Poetry, Conspiracy and Radicalism in Sheffield (2016). In the final years of the 18th century the editors of two of Sheffield’s most radical newspapers put everything on the line to stand up for the citizens of their city. Fearing that the actions of their monarchy and government represented a shift towards tyranny and a general lack of interest in the welfare of British citizens outside of London, Joseph Gales and James Montgomery took to the press to hold their government to account. As Gales himself stated in his final editorial, it was his paper’s ambition to ‘rescue my Countrymen from the darkness of ignorance and to awaken them to a sense of their privileges as human beings, and, as such, of their importance in the grand scale of creation.’ More than anything else, Gales wanted to prove to his readers their city mattered and that they deserved the respect and representation of their country’s leaders. Writing under the close scrutiny of suspicious local authorities at a time of intense censorship both the Register and the Iris presented their most controversial material in verse rather than prose. In a section referred to affectionately by contemporary readers as ‘Poetry Corner’, Gales and Montgomery provided a platform from local protest poets to express in incredible detail the attitudes and anxieties of their time. Reoccurring themes include the need for universal political representation and access to education, racial and religious equality, the abolition of slavery and the importance of worker’s rights. These lines proved prophetic, with the Register coming to an abrupt close a few months later. Charged with ‘conspiracy against the government’ Gales was forced to abandon the paper to start a new life in America as a fugitive. A portrait of Joseph Gales. Fortunately, within three months the paper would be re-founded by the young James Montgomery as the Sheffield Iris. As a teenager Montgomery had fled from Scotland upon discovering that his parents aspired to move abroad and work as religious missionaries. He had intended to get to London and peruse a career as a poet, but after getting stranded in Rotherham he decided to apply for a job at the Register. As a close friend of Gales and an acolyte of the Register’s politics, Montgomery worked fast and hard to rally funds and support for a new paper, the Sheffield Iris. This new paper would position itself as an explicit continuation of the Register’s ethos and vision. For this, Montgomery was twice sent to prison for publishing allegedly treasonous material. In 1795 Montgomery was hauled in front of a jury in Doncaster for printing and distributing a poem in support of the French, Britain’s enemies at the time. Montgomery’s lawyer proved that not only did Montgomery have no knowledge of the poem in question, but that it had actually been written ten years previously. Remarkably, Montgomery was still found guilty and sent to a prison in York. The post is adapted from a featured first published in the ‘Sheffield Star’ in April 2016. View the original article here. Find out more about the poems printed in Sheffield’s radical press by visiting Sheffield: Print, Protest, Poetry, 1790-1810. Don’t miss James Montgomery: A Life of Activism, a life performance to be delivered at 12pm and 3pm on 25 September 2016, the final day of the University of Sheffield’s Festival of the Mind. In a campaign fuelled by toxic rhetoric rather than political reality it is worth considering the message of the great 18th-century rhetorician and political writer, Joseph Addison. Addison’s politics were all about inclusion, collaboration and reconciliation: approaches that would serves us well both during the referendum on Thursday and throughout the inevitable slow violence of its aftermath. On Thursday 23rd the UK will be faced with a near impossible decision. Not only are we invited to take a stake in an unprecedented gamble but we are left to decide the best course of action using data that is practically unverifiable. So-called facts and figures have been massaged to such an extent in recent weeks that public confidence in government statistics is apparently so eroded that quantifiable evidence doesn’t seem to matter anymore. This last week, book-ended by vigils for unthinkable tragedies, has proved to some that popular political rhetoric in the West has become brutally simple; reduced to easy dichotomies such as Us and Them. I’ve been reflecting a lot this weekend on my own unwavering inclination to Remain. Yes, I fear for the economic repercussions of leaving and I’m deeply anxious about the cataclysmic impact that exiting the EU will inevitably have on the University sector. But actually, my feelings go deeper than that to an aspirational belief that it is best to embrace diversity, to broaden communities, to collaborate and pursue a common good for all. My head seeks rationale justification, my heart reaches for philosophy and ideology. It is for the latter reason that the Remain justification I’ve found most persuasive is Patrick Stewart’s account of life before the EU. I fear, though, that this impulse to side-step discussion of legislation and bureaucracy to instead nourish feelings and beliefs (or anxieties and animosities) is apparently the great strength of the Leave campaign. On Saturday, feeling confounded by the reported swell in Leave support I shared a link on Twitter to Stephen Bush’s article ‘Brexit: the day after.’ The short essay forecasts a sharp decline in the value of sterling, prompting the Bank of England to increase the basic rate of interest, in turn triggering an immediate crisis in Britain’s housing market and a ‘toxic cocktail of rent rises.’ Meanwhile, Bush predicts that Scotland would likely leave the UK to remain in the EU whilst the other 27 EU nations negotiated Britain’s exit amongst themselves. Within minutes of sharing the link I found myself ‘Quote Tweeted’ by Leave supporters who explained that my lack of confidence in the ‘sovereign power of England’ was unpatriotic and my fear-mongering predictions just plain ‘wrong’, that Britain would prosper (‘and that is a FACT’) and that the economy would be easily repaired if there weren’t so many immigrants coming in all of the time (this last one I found particularly irksome and there’s a pretty decent counter-argument here). Once I’d gotten over the initial adrenaline surge of being mildly-trolled I realised this was actually a good opportunity to try and figure out the allure of Leave. The Twitter-conversations I had over the next few hours were enlightening. Most seemed happy to discuss their thinking with me. One Twitter-user was especially generous with his time, imploring me to have faith in Britain. In fact, everyone I interacted clearly had the nation’s best interests at heart. What is more, some claimed to be weary with always putting others first. Justifications for this logic drew on a heady mix of different factors, many of which seem unrelated to each other (and at times to the EU question) but as a combination culminated in a feeling of long-term exploitation and under-appreciation. For instance, one recurrent frustration arose from a correlation being drawn between austerity and immigration. Some forcefully explained to me that they felt they were tightening their belts to pay benefits for EU migrants. Unfortunately, leaving the EU is unlikely to ease austerity for those with the least. Boris Johnson summed it up with his suggestion that plotted on a graph BREXIT’s economic repercussions would resemble a ‘Nike Swoosh’, with a sudden sharp drop and then a steady incline. Who are the people best suited to weather that initial storm? Surely, it is the Boris Johnsons and the Nigel Farages of this world, not the very people they’re relying on to vote this eventuality into being. My point is, however, that the conversations I had weren’t about facts, they weren’t even about the pursuit of facts. They were about feelings and beliefs. The EU decision was transfigured into a bigger, and perhaps simpler, decision. The perceived choice seemed to be between continuing to suffer on behalf of others or to finally put ourselves first, regardless of what might actually happen after Thursday. The affirmative act seemed more important than social, political or economic reality. So, if we’re putting the stats to one side in favour of making a vague ideologically-informed stand, let me suggest another choice. I was listening to two guest speakers debate the referendum on BBC Radio 2 last week. Their discussion over, the show opened up the phone-lines. The first caller made an impassioned case against the EU grounded in the premise that Britain has its own great industrial history and would be better off making all of its own products anyway. Just look at Land Rover, he said. A few calls later someone phoned in to stress that though Land Rover is a British company it imports parts from all over Europe and employs manufacturers from all over the world. It is the 21st century, they said; we live in a global community. It was at this point that my mind turned (as it so often does in times of great stress and confusion) to the eighteenth century and to one issue of an obscure early eighteenth-century periodical in particular: Joseph Addison’s Free-Holder. Addison’s Free-Holder, which ran for 55 issues between December 1715 and June 1716, is a text that I spent a lot of time reading during my PhD. 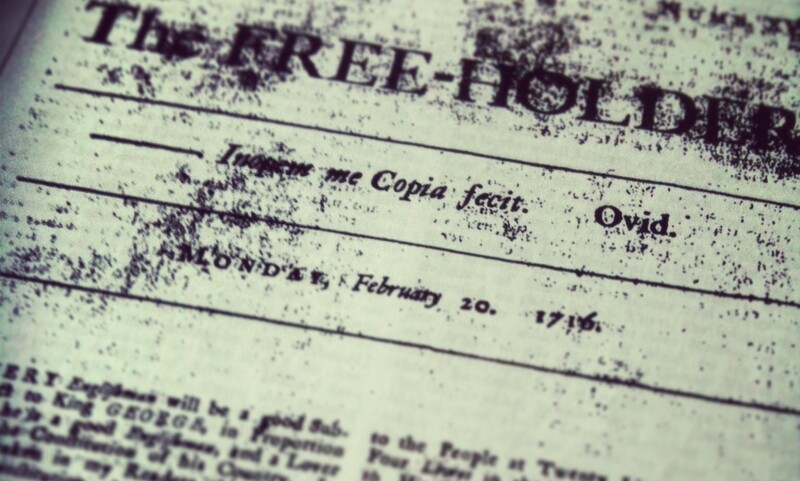 The Free-Holder was a Whig-sponsored periodical but you wouldn’t realise this if you picked one up at random. For the undiscerning reader it was simply a weekly periodical about the hobbies, interest and responsibilities of the property-owning gentleman. There is a single issue of the Free-Holder which gets cited far more than all the others. Even Samuel Johnson (who declared his dislike for the Free-Holder in general) acknowledged in his Life of Addison that this particular essay was one of Addison’s finest prose works. In this best-known issue Addison’s fictional editor, Mr Free-Holder, goes for a walk in the country and encounters a Fox-Hunter. The Fox-Hunter’s beloved British punch is like Land Rover, a British product comprised of European parts. This is, obviously, a satirical demonstration of Britain’s reliance on international trade and import. It is a Whig-sponsored parody of the Tory Fox-hunter and the men he represents. At the same time, though, it is also a powerful demonstration of Addison’s philosophy at large as he strove through both his state-craft and his writing to always meet political insults and polemic spleen with polite conversation. For Addison, the best way to win over an opponent was through the pursuit of reconciliation, ultimately incorporating them into an ever-broadening community. Essentially, Addison’s message was that solutions can only be found through compromise and conversation and, frankly, you’ve got to be in the room when the decisions are made to make a difference. Though Addison was far more capable of political sleight-of-hand than is often noted by his biographers, in trying to develop an alternative to political name-calling and character assassination I do think he was onto something important. Hate and anger are easy and disconcertingly effective ways to win someone over. Above all else Addison wanted to take hatred and anger out of the equation and replace them with politeness, which in the early 18th century meant listening carefully, talking calmly and swapping the splenetic for a sense of play and an emphasis on finding a mutually-beneficial solution. In that famous issue of the Free-Holder Addison is showcasing the power of such an approach. The Fox-hunter’s insults have no lasting effect but Mr Free-Holder’s logic leaves his combative listener in state of political (and arguably existential) confusion. We would do well to remember Addison’s philosophy of politeness, reconciliation and community, not just on Thursday but over the coming years. Looking beyond the referendum to the inevitable slow-violence of its aftermath Nicholas Lezard this week quoted Shakespeare: ‘So foul a sky clears not without a storm.’ This campaign, powered by fear and anger, has opened wounds more likely to fester than quickly heal. So, in keeping with the spirit of this whole referendum, all too keen to reduce politics to rhetoric, I’ll end with a rhetorical question that Addison posed in 1716 that proves all to relevant in 2016: Who do you want to be? Fox-Hunter or Free-Holder? Throughout the summer and autumn of 2015 I undertook a huge scoping project at Sheffield Archives, looking to identify materials of interest to the Faculty of Arts and Humanities at the University of Sheffield. Now, as I look to help convert these findings into future research opportunities, I find myself in the unique and hugely privileged position of having so many incredible stories to tell! In this strand of posts on my blog I hope to give you a fleeting insight into the many remarkable wonders held at Sheffield Archives. If you feel inspired, I implore you, make an appointment at 52 Shoreham Street and see these treasures for yourself. 52 Shoreham Street, Sheffield Archives. The Gatty family lived in the Sheffield area throughout the 19th century and were incredibly well-connected. Margaret Gatty, a children’s writer and marine biologist who regularly challenged Charles Darwin on the topic of evolution, married Rev. Alfred Gatty, who had previously served as the personal Chaplain to Lord Horatio Nelson during the Napoleonic wars. Their daughter, Juliana Ewing, also went onto have a successful career as a Children’s Writer, with the archive collecting her regular correspondences with the likes of Lewis Carroll and Rudyard Kipling. In addition to the family’s own extraordinary notes and correspondences, Alfred Gatty also instigated an impressive autograph collection which was continued on in later generations, bestowing upon the archive a number of volumes featuring the writing of such figures as William Wordsworth, Samuel Coleridge, Sir Walter Scott, Arthur Conan Doyle, Christina Rossetti and Florence Nightingale. A letter from Rudyard Kipling. However, for me, the material that is most impressive resides within a box of family ‘Juvenilia.’ Typically used with reference writers like Jane Austen and the Brontë sisters the term ‘juvenilia’ is defined in the OED as ‘works produced by an author or artist whilst still young’ – and believe me, as children, teenagers and young women both Margaret and her daughter Julia were prolific. One of the most extraordinary set of compositions present itself in the form of over sixty meticulously detailed ‘family magazines’, written in pen in imitation of those periodicals and magazines available in print at the time. More remarkable still, the collection demonstrates that this is a family tradition, with Margaret penning her own ‘Scorton Gazette’, whilst two decades later her daughter Julia produces the ‘Gunpowder plot’ and ‘Anon’ (described as being ‘a new periodical for the literary table’). And these were not fleeting of faddish endeavours, a new issue of ‘The Gunpowder plot’ appears every month from 1862-1871! The detail and dedication implicit in these pieces is astonishing. What is more, Margaret’s satirical ‘Scorton Gazette’ is hilarious from the very first issue (published May 4 1832). Here, on the incredibly detailed ‘advertisements’ page we find a ‘matrimony’ section. Elsewhere in the collection there are (once again) immaculately presented examples of extended prose, produced in imitation of their printed counterparts. At age 23 Gatty embarks on a ‘multi-volume’ series under the title ‘Tales of a Chambermaid’, the first installments being ‘James Jackson or, ‘tis six years since.’ Fascinatingly, Gatty does not write as herself but instead adopts the persona of that ‘Author of Waverly’, Sir Walter Scott. Young Margaret’s ‘novel’ in the style of Sir Walter Scott. As you’ll also have seen, Margaret and her daughter Juliana habitually and meticulously kept up their pocket diaries – Juliana more than Margaret. Juliana Ewing’s pocket diaries, hidden inside another book. Teenage Juliana details her daily activities in quite a lot of detail, listing where she’s been, who she’s spoken to, what she’s working on – even what she’s been reading. Please feel free to get in touch to discuss any academic research opportunities that might arise from working further with these collections. In this new strand of posts on my blog I hope to give you a fleeting insight into the many remarkable wonders held at Sheffield Archives. If you feel inspired, I implore you, make an appointment at 52 Shoreham Street and see these treasures for yourself. For my first post I thought I’d share with you a collection that brings us very close to a burning interest of my own: the life and work of James Montgomery. Formed in 1822 the Sheffield Literary and Philosophical Society (Lit&Phil for short) was a gentleman’s club dedicated to personal improvement and intellectual endeavour, where all topics were up for discussion except religion and politics. Sheffield Archives holds a spectacular and immense collection, likely so extensive due to the Society’s antiquarian impulses and penchant for ever keeping one eye on posterity. This is a penchant personified by one of its central members: poet, writer, journalist, abolitionist and bona fide local legend James Montgomery (namesake of Montgomery Theatre, Montgomery Road and the full size Montgomery statue standing outside Sheffield Cathedral). James Montgomery Monument, currently located beside Sheffield Cathedral. The collection holds notes, letters and lectures by founding members, who include not only Montgomery but also the extraordinary poet, scientist, geologist, philosopher and self-styled polymath Henry Clifford Sorby; a man who would eventually bankrupt himself buying a glass bottomed boat so he could catalogue the marine life dwelling amidst the rivers and water ways of rural Yorkshire. Another founding member was John Holland, local poet and librarian for the society. There are also account books, minute books and over 70 years of diaries. Indeed, the diaries of founding member Thomas Ward deserve an archive all of their own, as Ward kept not only the pocket books that we have out today (for keeping track of appointments and important occasions), but he also wrote daily in a journal, keeping a discursive record of his life’s events. Furthermore, the books themselves are fascinating insights into the expected priorities of the 19th-century gentleman living in Sheffield. If you turn to the contents page of Ward’s branded Daily Journal or Gentleman’s Merchants and Tradesman’s Complete Annual Account Book of 1800 (to give it its full title) you get an insight into what it was that working gentlemen were expected to know: a list of bankers, a table of exchange rates, times of sunrise and sunset, instructions for writing a will, the names of MPs in the house of commons and the house of lords and the distances of towns from the Thames. How times change. Click here to read more about my work on James Montgomery. In September 2015 I joined the University of Sheffield’s ‘Mobile University’ Weekend to talk about some of the exciting revelations that have come to light during my archival research into one of Sheffield’s biggest names: James Montgomery… on a bus! The Mobile University bus parked on the Moor, Sheffield City Centre. Using primary sources from Sheffield Archives and The University of Sheffield Library Special Collections I was able to piece together and tell for the first time the fascinating story of how James Montgomery – a man later remembered as a great philanthropist and benign statesman – came to be charged for sedition, treason and slander. During the early decades of the nineteenth century James Montgomery cemented his reputation as one of Sheffield’s most enduring legends. A poet, booksellers, humanitarian and abolitionist Montgomery dedicated his later life to ensuring freedom and fairness for all. When he died the city mourned with a public funeral, before erecting a large statue (currently standing outside of Sheffield Cathedral) to commend his religious and philanthropic virtues. The early decades of Montgomery’s life are, however, less well-documented. Based on newly conducted archival research, this lecture traced Montgomery’s turbulent time as editor of one of Sheffield’s very first newspapers: The Sheffield Iris. Whilst working for this paper Montgomery was twice tried for sedition for his poetry, which was interpreted by some as a treasonous condemnation of the country’s monarchy and government. Montgomery’s defence offered countering interpretations of this poetry and, crucially, the outcome of the trail came to a question of literary criticism. Montgomery’s guilt was entirely dependent on how the jury interpreted his poetry. Some feedback left after the talk had finished. During this lecture, on a bus in the middle of Montgomery’s own city, we re-visited this fascinating moment in legal, political and literary history, and invited the audience to make their own decision on the meaning of Montgomery’s controversial poems. It was an absolute privilege to deliver this talk on the very streets that Montgomery fought so for throughout his career and to see first-hand what a large appetite still remains to heat is story told in full for the first time. Read more about my work on James Montgomery.